Serving Institutional, Industrial, Food Service and Retail customers. At Harris Spice, our mission is to source and distribute the finest spices and herbs, in a safe, secure and sustainable manner. The spices & herbs we process – be it for our retail, food service or industrial customers – meet the highest standards established by the industry. As the only global spice company, we are truly vertically integrated & understand that food is a serious business. In fact, at Harris, we think of spice as more than a commodity, but a commitment to quality & service. Our presence in key spice growing countries has fostered strong relationships with growers who share in our philosophy for safe, clean, pure spices for the end consumer. Attesting to our commitment are the strategic partnership processing facilities located around the world. The strength of our business comes from our extensive knowledge & experience, learned over decades. We are committed to sourcing as sustainably as possible so that farming communities grow with our success. Our origin spice processing facilities share a common philosophy of the highest food safety standards in processing – be it cleaning, sterilization, milling, packaging or shipping. Our presence in the US as a purveyor of fine seasoning blends and distributor of quality spices give us a strategic advantage of being a truly end-to-end supplier. We source our spices and herbs directly from premium growing regions including India, Vietnam and Turkey. Our global procurement team establishes relationships with local farmers to ensure a steady supply of high-grade product while maintaining ethical trade practices. Sustainable Procurement and Traceability: Our backward integration program provides training and education for farmers to promote sustainable growing practices and product traceability. Verification through audits: We audit the factories of our vendors and visit farms to ensure good manufacturing practices. Scientific crop survey and forecasting models: We closely monitor market movements to make informed decisions and provide our customers with detailed market intelligence. Inventory control and management: During high crop season, we procure and maintain high inventory levels to assure a steady supply of our products. Our technical knowledge and processing experience of over 30 years helps to provide a full range of spices & herbs in various grades for all of your needs. We can manufacture our spices and herbs to meet your specific needs and specifications for granulation and origin. Please contact us to discuss your requirements and for further information on our spices and herbs. We offer many different cuts of Onion and Garlic sourced domestically and internationally. Garlic and onion are a must have for all food manufacturing applications. If you need a custom blend, we can create one just for you. Contact us to discuss your customized need for garlic and onion. 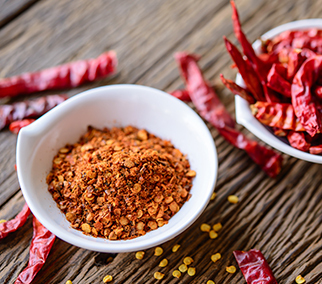 With our extensive knowledge and experience in spices and Seasoning blends, we have created a wide array of customization options for institutional, industrial, food service and retail applications. Please contact us to further explore our vast offering of seasoning solutions. Harris Spice has been an ASTA member for over 25 years and involved in the various aspects of the association to serve the industry. Harris Spice is proud to be a member of the Grain and Free Trade Association, which promotes international trade. Harris Spice’s membership to the IFT is important to understand the Food Science and trends in the industry. Our strategic partner, the Jayanti Group, is a long-standing member of The Spices Board of India. Harris Freeman Vietnam is a member of the Vietnam Pepper Association. Harris Spice is a member of the International Pepper Community. Our Vietnam and Indian plants are C-TPAT Audited by 3rd party Auditors. CBP (Customs and Border Patrol) audits all facilities for compliance. Our Vietnam, India and Turkey facilities are BRC certified. Indian Products Ltd, the Jayanti Group’s spice operation has been certified HACCP Compliant – Certified by TUV Management Service. Harris Freeman Vietnam has achieved ISO 9001-2001 Certification for Processing & Exporting Spices and Agricultural Products. Our Spice processing facilities in India and Vietnam are OU Kosher Certified. The Jayanti Group’s Indian Products Ltd. facility has been approved by the Export Inspection Agency to perform samples. Our Anaheim, California location is the newest operation for spice value enhancement. Supporting our strong philosophy of growth, our 130,000+ square foot of combined Anaheim facilities – grind, blend, pack and store spice and seasoning blends for the Food Service and Retail industries. With an array of blenders and packaging machines complemented by a Food Service R&D lab, Harris aims to forge new paths in food and taste innovation. The Harris Freeman Vietnam spice processing facility in the Binh Duong Province is located about 55 miles from Ho Chi Minh City. The facility is newly built, encompassing a total 105,000 square feet which includes an on-site ASTA cleaning feature, advanced grinding machinery, and 100 plant and office personnel. Our strategic partner in India, Jayanti Spices, own and operate 3 processing facilities in close proximity to key spice growing regions. The flagship plant is a 175,000 square foot plant in Coimbatore, Tamil Nadu possessing a processing capability of over 10,000 MT of spice per annum. This state-of-the art plant is BRC certified and professionally managed by experienced technical, operational and commercial personnel. 10 processing lines individually structured to meet quantity and quality standards. Located in the Aegean Free Trade Zone of Izmir – Turkey, SteamLab, a subsidiary of the Jayanti Group, is an important herb & spice partner for the Mediterranean & North African herbs. SteamLab processes, mills and sterilizes routinely with exacting standards. An important gateway to Europe, SteamLab has retail and food service packaging capability and services some of the well-known name brands in Europe. SteamLab’s sustainable sourcing of herbs in Turkey is a testament to the shared Harris philosophy.